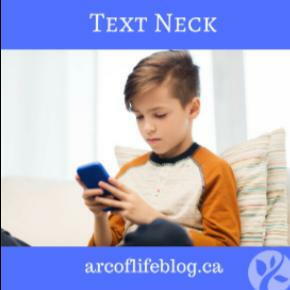 Text Neck is a common occurrence in people of all ages. Smart phone users spend an average of 2-4 hours/day hunched over on their phones, texting, emailing, searching the web, etc. This translates to 700-1400 hours/year for the average adult. High school and post-secondary students spend even more time in a hunched-over position looking down at a phone- almost 5000 hours/year! This position causes a phenomenon known in chiropractic as “Text Neck”: cm-by-cm, the head shifts forward and down. In a normal, upright position, the average head weighs 10-12 lbs. As the head shifts forward and down with this common posture, the weight of the head on the body increases and can be as heavy as +60 lbs. That’s like carrying around an 8-year-old child for 2-4 hours a day on your neck! What does this position do to the structure of the spinal cord? This constant weight and pressure on the spinal cord from Text Neck leads to an accelerated rate of structural changes: vertebral degeneration, disc compression, arthritis, bone spurs, and hunchback (kyphosis). We used to see these changes mostly in middle-aged adults and elderly practice members. Now this is starting to appear at younger and younger ages. School-age children are spending more time looking down at technologies, causing structural changes of the spinal cord to appear in children as young as 4 years old! 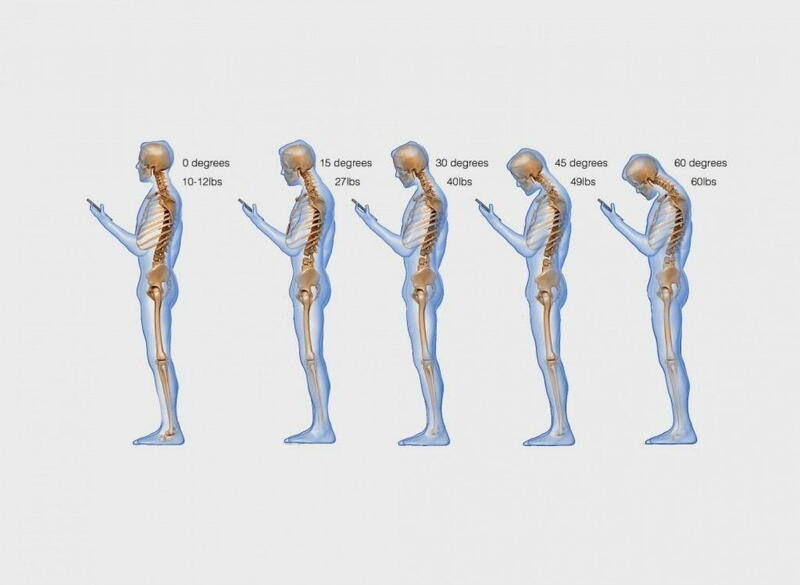 What can we do to combat the effects of Text Neck?